We're pretty much against the over-commercialization of any holiday, and will gladly substitute old-fashioned simplicity for sophisticated extravagance any day of the year - including Halloween! The text that follows is taken from Armour's Monthly Cook Book, Volume 2, No. 12, October 1913 - A Monthly Magazine of Household Interest. There's no doubt the magazine's readers were more frugal than today's party hosts and hostesses, but we also think there's a possibility that they might have had more fun at their parties than we moderns have at ours . . . The date of this old-time celebration is always October 31st, the crucial moment 12 o'clock. To be sure, the original observance of All Hallows Eve has been considerably distorted during the course of years but the fun it affords the young folks in its present manner of keeping cannot be gainsaid and needs no changing. Halloween is the night when a magic spell enthralls the earth. Witches, bogies, brownies and elves are all abroad to use their power. Superstition proves true, witchery is recognized and the future may be read in a hundred and one ways. No occasion gives more opportunity of enjoyment and no party is gayer than a Halloween party. It is not necessary to spend a great deal of money in giving a Halloween party. 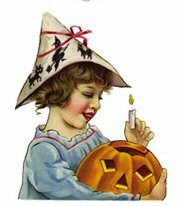 With a little time, some suitable paper and a pair of sharp scissors the witches, pumpkin faces, cats and bats, which are the distinctive features of this decoration, may be easily made at home. Yellow, red and black are the colors and the most fascinating crepe paper can be had for a few cents. This is the best material to use, as it lends itself so well to all sorts of schemes. Not only is it made in plain colors which may be decorated at will but for every festival and occasion there are special designs which make the work of decoration very easy indeed. 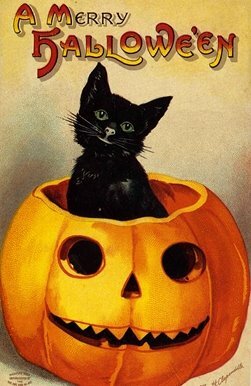 For Halloween there is a design of witches with brooms, or cats and bats in black on a yellow ground. This is ready to be laid on the table as a cover or around the room in the effect of a frieze. There are napkins to match and a crepe paper rope to finish the edge. The wise owl must not be forgotten in the Halloween decorations. Grey paper is best for him. Paste the edges of a square piece of grey crepe paper together lengthwise of the grain and gather in at the bottom. Stuff this bag with soft paper or cotton and gather again some distance from the top. Shape the top into ears and make two rosettes with black centers for eyes. A beak of black stiff paper protrudes between the eyes. Mount the owl on a branch by sewing with heavy black thread in a way to resemble claws. Make witches' brooms by tying slashed paper tied on any old sticks or brooms to give the effect. Bake large apples from which the core has been removed until soft, but not long enough to burst the skin. When cooked, insert a marshmallow into the core space, put a teaspoonful of sugar on top and a few maraschino cherries. When ready to serve turn over each a scant teaspoonful of brandy and light just as the table is reached. The brandy will burn with a ghastly flame and melt the sugar and marshmallows. Whipped cream served in a bowl is a delicious addition. Cream one half cupful of butter with one and one half cupfuls of sugar; add three eggs and beat five minutes; add one cupful of milk. Sift together one third cupful of cornstarch, and two cupfuls of flour, one and one half teaspoonfuls of ground mixed spices, and three teaspoonfuls of baking powder; then add to the mixture. Now add one cupful of seeded floured raisins, also one cupful of chopped nuts. Turn into a well greased loaf cake pan and bake in a moderate oven about forty-five minutes. Frost with a white boiled icing. Melt sweet chocolate to equal one third cupful, flavor with a teaspoonful of lemon juice, add one cupful of boiled chestnuts which have been run through the meat grinder, and enough confectionery sugar to make a paste easily handled. Roll and cut (by pasteboard pattern) black cats or any other Halloween figure, press them into the icing on the sides of the cake.